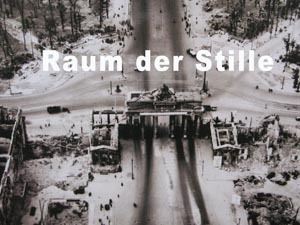 Raum der Stille (Room of Silence) is a room next to the Brandenburg Gate, Berlin set up in 1994 five years after the wall came down. It is a non-denominational space where everyone is encouraged to remain silent, relax and reflect on “the dark but hopeful events, to meditate and to feel gratitude for the achievements of recent years”. I recorded this room using binaural microphones. The floor is tiled and the chairs and door creak making the room anything but silent this created a self-conscious and uneasy feeling (most people staying no longer than three minutes). I used the raw sound with adjusted sound to represent the full experience in the room. Mick O’Shea lives and works in Cork city and is a member and director of the Cork Artists Collective and has exhibited in Germany, Lithuania, Belgium, Scotland, Tasmania, Japan and Finland. He studied instrument physics in C.I.T. and works as an instrument technician in UCC. All of his works spring from his essential experience in drawing. His medium includes sculpture, drawing, sound and cooking. O’Shea formed Domestic Godless with Stephen Brandes 2003 to create cooking events and recipes that transgress our food taboos. He also works with various sound artists both national and international. In 2006 he formed The Quiet Club with sound artist Danny McCarthy to promote and showcase improvised music and soundworks.